Arno was born in the Black Forest region of Germany. While growing up he nurtured a musical curiosity, which became a life commitment to the pursuit of music. In pursuit of his interest, he joined his schools music club, where he participated in various band projects. This gave rise to thoughts of becoming a "professional musician." He received real life experience with being a musician while serving a year in the Air Force Music Corps/Karlsruhe. He says, "this experience was one reason for my decision to become a professional musician." 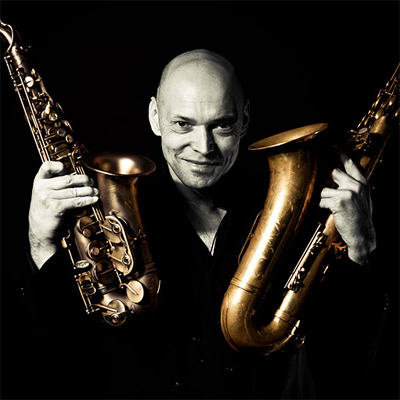 To further his career, he studied at the Swiss Jazz School at Bern (Switzerland) from 1989 to 1994 and graduated at the Swiss Jazz School in Berne with Andy Scherrer, by participating in a master class workshop with Joe Lovano. While in school, he met "the master of the Blues, Sidney "Guitar Crusher" Selby, and he was chosen to perform with the Cadillac Blues Band from Fribourg for a 10 year tour. While on tour, he says "I learned to play and live the blues." His touring experience attracted more work in the of "CD recordings and concerts with international stars such as Ricky Lawson, Calvin Owens and Alvin Lee." 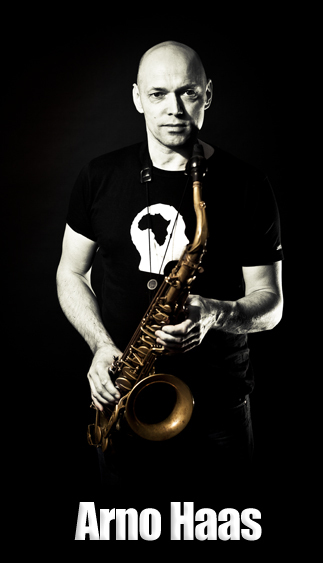 He collaborated with the singer and keyboardist Jurgen Waidele and his cult band, Waidele Conversation‚ which opened many more musical doors for him. As he grew in his musical craft, he expanded his repertoire and mastered other styles and "different genres to be able to play solos over all possible styles of music. 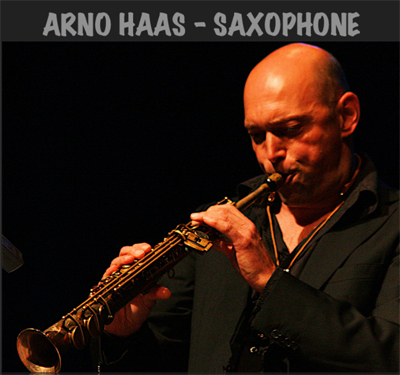 For Arno, playing soprano, alto and tenor saxophone instruments were evenly matched. 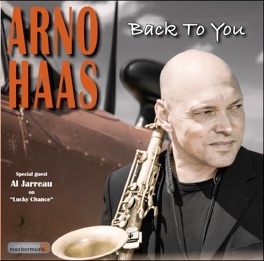 "During his musical career, Arno has played with "various bands and musicians such as Franco Ambrosetti, Peter Herbolzheimer in Jazz, or with the (ex-Rolling Stone) Mick Taylor, Paul Kuhn, with the Duke Ellington Orchestra, Joo Kraus, Ack van Rooyen, Nikolas Simion, Peter Herbolzheimer, Tom Novy, Nubya, Gola, Sandra Studer, Maya Brunner, Polo Hofer, Lokua Kanza, Henri Dikongue, Wolfgang Haffner, James Moody, Thomas Stabenow and many others. 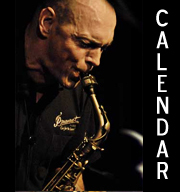 Since 2009 he has been a member of the Stuttgart Jazz Orchestra. The collaboration with Wolfgang Dauner and Helen Schneider started through this Orchestra. An important experience in 1998 was the meeting with the American saxophonist Bob Malach. They spend a lot of hours together in Zurich and New York." 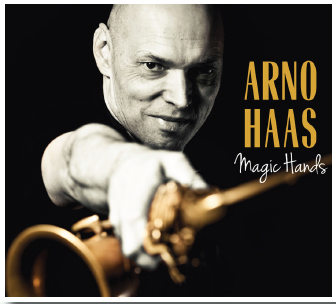 Arno Haas - "Magic Hands"
"Arno Haas was born and grew up in the Black Forest. The first musical steps began at the music clubs very soon followed by various band projects. At the end of the eighties, he spent a year as a „professional musician on time,“ at the Air Force Band / Karlsruhe, which recently consolidated the decision to be a professional musician. From 1989 to 1994 he studied and graduated at the Swiss Jazz School in Berne with Andy Scherrer, by participating in a master class workshop with Joe Lovano. The first opportunity to go on a tour with a professional band resulted in 1992 with the American blues veteran Sidney ,Guitar Crusher, Selby. The ten-year collaboration with the blues singer led him on countless stages in Europe. The result: CD recordings and concerts with international stars such as Ricky Lawson, Calvin Owens and Alvin Lee. The collaboration with the singer and keyboardist Jurgen Waidele and his cult band, Waidele Conversation ‚opened many more musical doors for Arno. He also acts in various formations of different genres. This needs to be able to play solos over all possible styles of music, formed his stylistic flexibility with a personal touch nonetheless constantly. It also meant that soprano, alto and tenor saxophone instruments were evenly matched for him. 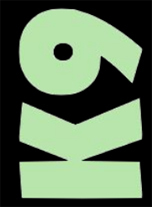 There were further CD productions with various bands and musicians such as Franco Ambrosetti and Peter Herbolzheimer in Jazz, or with the (ex-Rolling Stone) Mick Taylor at the Blue Rock area. 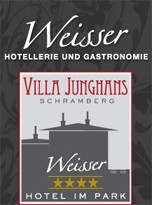 Since 2009 he has been a member of the Stuttgart Jazz Orchestra. The collaboration with Wolfgang Dauner and Helen Schneider started through this Orchestra. An important experience in 1998 was the meeting with the American saxophonist Bob Malach. They spend a lot of hours together in Zurich and New York. This is a musical inspiration for Arno and give him the opportunity to have more ideas. 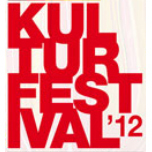 Furher cooperation with : Paul Kuhn, Duke Ellington Orchestra, Joo Kraus, Ack van Rooyen, Nikolas Simion, Peter Herbolzheimer, Tom Novy, Nubya, Gola, Sandra Studer, Maya Brunner, Polo Hofer, Lokua Kanza, Henri Dikongue, Wolfgang Haffner, James Moody, Thomas Stabenow…"